You have added Antique Bronze Embellished Dress in Ivory into shopping cart. This unique embellished dress is one of our favorites—and it comes in two color options for you to choose from. The Antique Bronze Embellished Dress is fully lined below the waist. 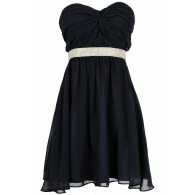 It has a strapless neckline, empire waist, and A-line skirt. The best part of this dress are the bronze beads and miniature sequins that decorate the bust of this dress. A hidden back zipper completes this look. We love how this dress has a laid-back boho-chic vibe with a touch of shine. 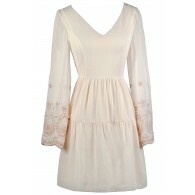 This is a dress that can be worn casually with flat sandals or dressed up with wedges or pumps. Another option is to pair this dress with brown cowboy boots for a country look. Also available in Powder Blue. Details: Lined below the waist. Hidden back zipper. 100% polyester. Hand wash cold water separately. Color will bleed. No bleach. Hang to dry. Small measurements: Length from top of bust to hemline: 27.5”. Bust: 34”. You have added Antique Bronze Embellished Dress in Ivory into Wishlist. You have added Antique Bronze Embellished Dress in Ivory for Stock Notification. 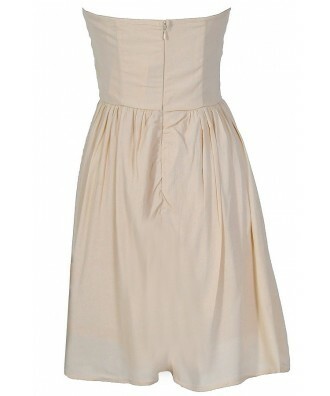 You have set Antique Bronze Embellished Dress in Ivory as a loved product. You have removed Antique Bronze Embellished Dress in Ivory as a loved product.